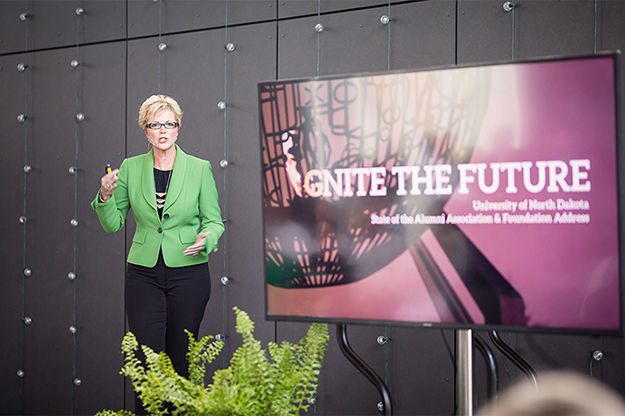 In her August 22 State of the Foundation address, DeAnna Carlson Zink announced that, during the Fiscal Year 2017 ending on June 30, the UND Alumni Association & Foundation rallied nearly 10,000 donors to help meet its $40 million fundraising goal. Photo by Sam Melquist. Brittany Dvorak stood among dozens of UND staff, faculty, alumni and student representatives filling the Gransberg Community Room of the Gorecki Alumni Center, a walker placed before her. Gripping the microphone, the UND Communication student and Grand Forks native spoke of her lifelong love of sports, and how a leukemia diagnosis shifted her involvement in athletics. Brittany’s story of perseverance was one of many shared on Tuesday, made possible this year by the work of the UND Alumni Association & Foundation. In her August 22 State of the Foundation address, Carlson Zink announced that, during the Fiscal Year 2017 ending on June 30, the UND Alumni Association & Foundation rallied nearly 10,000 donors to help meet its $40 million fundraising goal. An incredible $19 million of that has already been earmarked for student scholarships, with another $6.6 million set aside for programs and faculty. Scholarship support from the Foundation increased by 8 percent from the previous year, a boost that UND President Mark Kennedy knows doesn’t come easily. 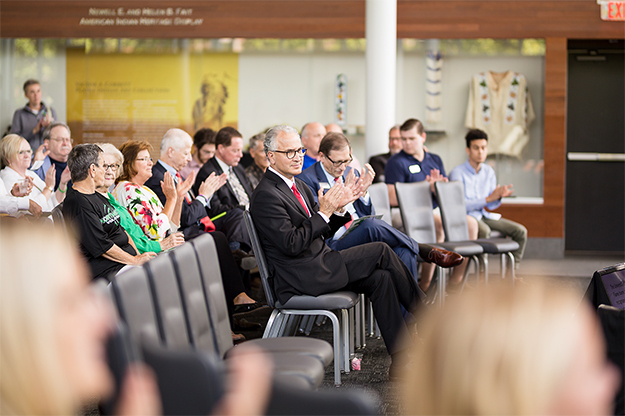 UND President Mark Kennedy leads the applause during the UND Alumni Association & Foundation’s State of the Foundation Address on Tuesday, Aug. 22. Photo by Sam Melquist. The Foundation is more interested in the impact than the dollars themselves. With the money raised over the last year, it has passed along more than $7 million in donor support to Fighting Hawk student-athletes. Carlson Zink noted that these athletes returned the favor by setting a new GPA record of 3.279 for Spring 2017. The North Dakota State Legislature also played a role in enhancing scholarships through the Higher Education Challenge Fund. 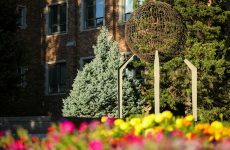 The State provided more than $3 million in match money, which was met with $6 million in donor gifts, creating a total scholarship impact of almost $10 million. “So thank you, legislators and the State of North Dakota, and all of you as citizens, for funding this special initiative,” Carlson Zink said. Additional funds raised by the Foundation helped kick off the Eye of the Hawk lecture series, which has already brought in two distinguished speakers to engage the UND community in important discussions on economics and diversity. Another is planned on September 25 with speaker Neel Kashkari, president of the Federal Reserve Bank of Minneapolis. This year, the Foundation tapped into the power of crowdfunding by starting Act. The platform helps units on campus with fundraising for specific initiatives. One major example of crowdfunding success was the UND Pride of the North marching band, which raised $88,000 for new uniforms. “For this fiscal year, we already have four projects in the works, and I’m really looking forward to more exciting opportunities on how these are going to impact today’s students,” Carlson Zink said. 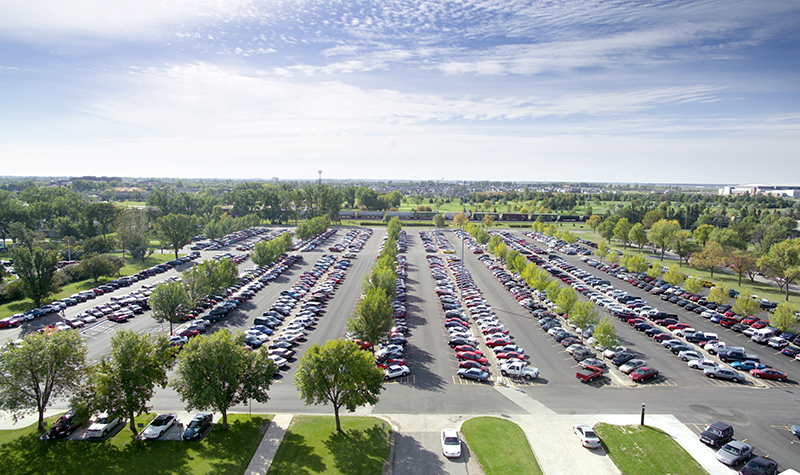 The Alumni Association & Foundation hopes to raise $52 million in the current fiscal year. The team also plans to redouble its efforts in supporting students, starting with the development of the UND Promise Scholarship Program. Carlson Zink concluded her address by sharing the stories of the many women touched by the Dru Sjodin Memorial Scholarship, awarded for the past 12 years in remembrance of the former UND student who was abducted and killed in 2003. It was difficult for Carlson Zink to hold back her emotion as she talked about 2005 recipient Leah Hoffbeck, whose scholarship money allowed her parents to send not one, but both of their daughters to college. 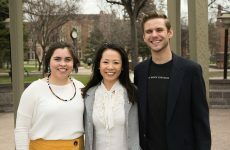 “Every single one of these students has gone on to make a difference in so many other lives, and that number will just continue to grow as the scholarship continues,” she said. Gifts such as the Dru Sjodin Memorial Scholarship and others have opened up endless possibilities for students like Brittany Dvorak, who won’t let hardship keep them from their ultimate goals. “This University is definitely a special place, and I’m so, so proud and honored to be a part of this legacy,” Dvorak said to the applause of the crowd.